On the Admin Page’s Security and Setup Warnings section, I got a new warning that needed investigation. Transactional file locking is using the database as locking backend, for best performance it's advised to configure a memcache for locking. See the documentation ↗ for more information. From the documentation, it seems that the OwnCloud team played with the cache to make OwnCloud faster. APCu is gone and in is Redis. There are two steps suggested that need to be done to get rid of the warning message and to get your OwnCloud server faster! (1) Go to your Apps and the Disable File Locking. When setting the default locations, make sure your user has permissions or you have to use sudo on the rest of the steps. Change the given command to the following suggested command per www.antojose.com. 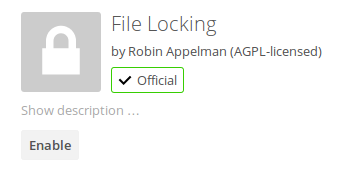 This entry was posted in How-To, Nextcloud/OwnCloud and tagged apcu, cache, file locking, owncloud, Redis, security and setup. Bookmark the permalink.